The quad BOP has a four ram configuration to provide positive protection against blowouts and to secure the well in emergencies. 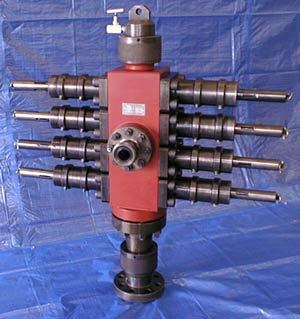 This permits work to be carried out, under pressure, on surface equipment while the tubing is still in the wellbore. The quad features separate blind seal rams and shear rams, as opposed to a combination shear/seal ram design in the tri-modular BOP. The BOP is placed directly above the wellhead. The quad BOP is similar in operation and features to the tri-modular BOP. Hydraulic closure system for the rams have manual overrides available. These overrides operate the rams in case of hydraulic failure and hold them mechanically locked once they are in the closed position. Pressure equalization operation is also identical. Vanoil Equipment Incorporated, Bay 1, 8075 49 Avenue, Red Deer, AB T4P 2V5. Tel: 403-347-8280; Fax: 403-347-8281.